I was playing around with a new scope setup and thought I'd shoot something that was visually interesting. 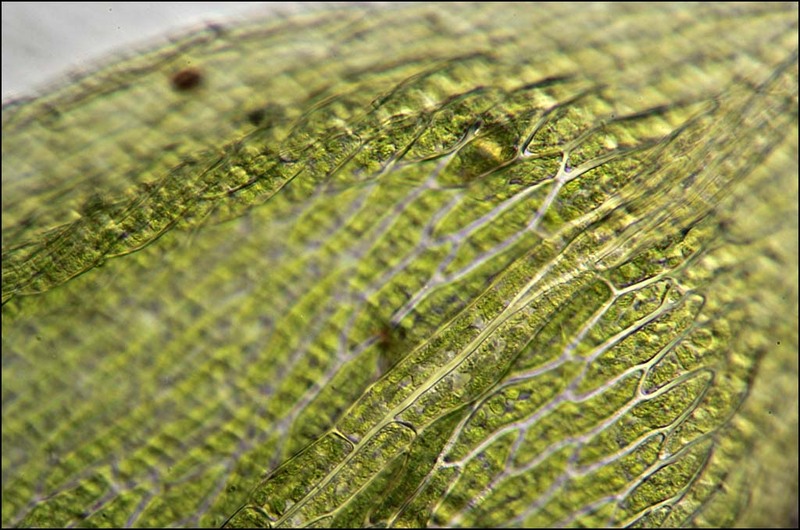 This is a moss leaf. It's like the one shown HERE, but cut off the plant, immersed in water under a cover slip, and imaged with a 40X NA 0.65 objective. Zerene Stacker PMax, 41 frames (uncalibrated tweaking of the fine focus knob). Nothing special here. I just thought since I went to the trouble to make it, I might as well post it out. Your new setup provide a great result. It's very good to see what excellent results can be obtained with a relatively unsophisticated microscope and coupling setup. It is encouraging for beginners too. Thanks for the feedback, Pierre and Cactusdave. Yes, this is not a sophisticated setup at all. The main trick is to use an old non-zoom lens that has its entrance pupil fairly far forward, instead of a modern zoom that has it far back. There is one remaining glitch, that when the camera is lined up perfectly on axis there is a stray reflection someplace in the system. Tipping the camera a few degrees off-axis and stopping down the camera lens to just before it starts to vignette takes care of that problem, in limited testing so far. Very nice! There's a lot to be said for the basic afocal method. We don't see it used here all that much, but these results and Arturo's show that if done properly, it works fine. There is one remaining glitch, that when the camera is lined up perfectly on axis there is a stray reflection someplace in the system. This can be a real tricky thing to track down and eliminate. Back before I settled on the NFK's I tried a variety of afocal set-ups. The one that worked the best (resolution and aberration wise) was plagued with a "hot" circular spot in the middle that I simply could not eliininate. I'm pretty sure these reflections have to do with the curvatures of the optical surfaces (eyepiece and camera lens primarily) and possibly, in addition, the highly reflective nature of the low pass filters in front of the sensors. Certain combinations seem to have no issues, while others are essentially unusable. I cannot tell for sure where in the optical system the problem is occurring. I suspect the prisms in the binocular head. The problem in this case is not actually due to the camera, it's just that the camera exposes it. Having spotted the problem through the camera, I can now find it by eye as well. 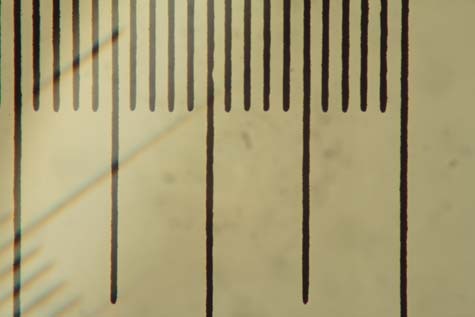 It turns out that due to the internal reflection, the microscope effectively has two apertures: the normal big round one provided by the objective seen on-axis in the usual way, and a second one, smaller, crescent-shaped, and off to one side, provided by the objective seen off-axis via the reflection. At the exit pupil of the eyepiece, these two apertures are well separated. My eye naturally centers on the main one, and the other one is blocked by the iris of my eye. I didn't even know it was there. But the entrance pupil of the camera is bigger and farther back, where the two apertures are not well separated. As a result, when I'm using the camera in this afocal arrangement, it tends to see the reflection that my eye does not. Interesting, and initially quite puzzling. Of course now that I know what's causing the problem, I can go about adjusting things to get around it. That's relatively easy in this case. The type of "hot spot" that you mention can be much less tractable. Edited to add: The archives of the Yahoo Microscope group are chock full of discussions about concentric rings that appear as if by magic when certain compact digitals are pointed down an eyepiece. Used normally, the cameras work great. Viewed by eye, the microscopes work great. Put the two together and the rings appear. I've been reading carefully for several years, and I have not yet seen a convincing explanation of what causes the rings. When you took the photographs in this thread, was the ambient or room light low and did you cover the unused eyepiece? I've just begun to explore the taking of images through a microscope via a trinoc tube with an NFK 2.5X photo eyepiece. At first I could not work out why I had a horizontal band of light through the centre of the images, turns out the light was entering via the eyepieces. At the moment I have the Canon 50D attached independant of the scope to a Kaiser copy stand. I am using the MPE-65 (at lowest magnification) on the 50D. The camera is suspended above the NFK 2.5X which is sitting in the trinoc tube. Beautiful stack. 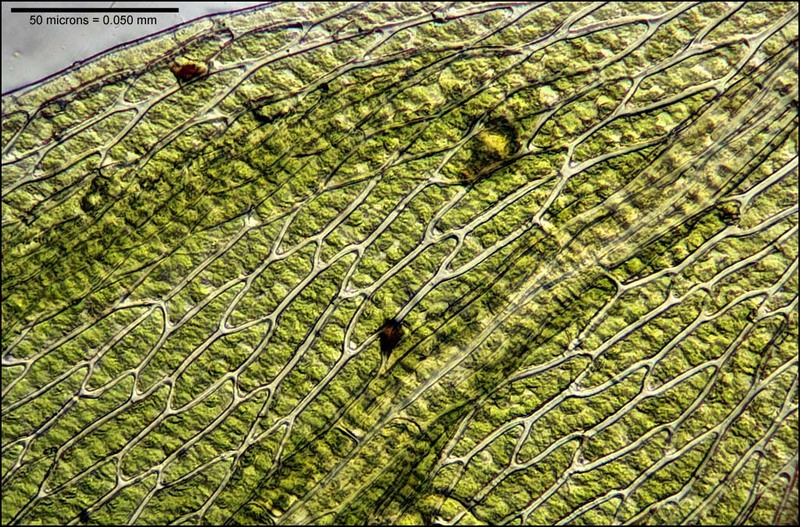 The leaf veins can be quite birefringent on some moss species, you might try the same specimen between crossed polarizers (with or without a quarter wave plate in the mix). I am using the MPE-65 (at lowest magnification) on the 50D. The camera is suspended above the NFK 2.5X which is sitting in the trinoc tube. Since photo eyepieces were made for direct projection onto the film/sensor I wonder what the reason could be that you use the MPE-65 inbetween, and don't just project with the NFK on your 50D's sensor directly? The room light was normal. The unused eyepiece was not covered, but it was looking up at a fairly dim chunk of ceiling. Given the brightness of the condenser beam and the dim area seen by the eyepiece, there was no problem with stray reflections. If there had been something like a ceiling light right above the microscope, then I think there might have been some flare. I retested just now, repositioning the scope directly under a fluorescent fixture. With the scope illuminator turned off, and looking through one eyepiece by eye, I could definitely detect blocking and unblocking the other eyepiece. With the illuminator turned on, I could not. Obviously this would be dependent on the relative brightnesses and on the exact optics in the scope. Covering the unused eyepiece seems clearly a good idea, it just didn't occur to me. David, thanks for the suggestion about birefringence. I'll take a look, next time I have a chunk of moss handy. Like Betty, I'm a little puzzled about the arrangement you mentioned. If you go "afocal" technique (lens on camera) the lens should be focused at infinity and a normal "viewing eyepiece" should be in the trinocular tube (and ideally be in focus when the binocular viewing eyepieces are in focus). This can work fine, it's just a little tricky to get a lens/eyepiece combination that matches up nicely and provides an image with no vignetting. While we have, from time to time, mentioned that lower powers and lower NA's can accommodate a fair amount of difference from the tube length for which they were designed, it is always a good idea to have things set up so that the proper focus is achieved through the eyepieces (with the microscope set up properly). If you need to slightly "touch up" the focus in order to get the camera focused perfectly that's OK.... but you really do not want a significant difference between proper "viewing" focus and "camera" focus. I'm new to this approach, so had been trying different configerations with equipment on-hand. I tried the 1:1 lens approach with the 100/2.8 but didn't achieve a good result (with or without NFK). I was then going to try the Micro Nikkor 55mm/3.5 with PK13 but decided to put the MPE on the 50D instead. Suddenly (with NFK in tube), I had a reasonable representation of the field-of-view and subject on the sensor with no vignetting. I'll try it with just a standard eyepiece. Have not been able to get much success with direct projection from photo eyepiece to sensor (and the dust factor is a concern). Are you able to recall the depth of the slices used for the stack? To put it another way, how far did you move the fine focus dial for each slice? So it was a visual estimation? Correct. That scope has a fairly coarse fine focus (300 microns per rotation), with smallish knobs and no indicator marks. So I just repeatedly picked bits of the subject that were at the edge of high focus, then tweaked the knob until those bits were at the edge of low focus. I also made no attempt to keep track of total movement.